Radiofrequency (RF) devices deliver high frequency energy to the biological tissues thath as been either cut or coagulated. A pulsed-type RF irradiation elicits thermal and/or non-thermal effects by delivering a particular rate of gated RF oscillations. In the present study, we describe two patients with nasal rosacea, who were effectively treated with invasive pulsed-type, bipolar alternating current (AC) RF treatment using microneedle electrodes. The RF treatment was delivered to these two patients with a power level of 3, a microneedle penetration depth of 1.5 mm, and 2–3 passes over six (patient 1) and 12 (patient 2) sessions, at two-week intervals. The first patient presented marked clinical improvement with respect to both the overall redness and papulopustular lesions; the second patient exhibited noticeable improvement in both the texture and telangiectatic lesions on the nose. Both patients were satisfied with the clinical outcomes without remarkable side effects. Various energy delivery devices, including pulsed-dye laser and intense pulsed light, have been used for the treatment of rosacea as alternative or combination treatment modalities.2 Long-pulsed lasers with a pulse duration of 0.35 to 40 milliseconds at the wavelengths of 585 nm or 595 nm effectively destroy congenital and acquired vascular lesions through the selective photothermolysis of target chromophores.6 The laser energy is preferentially absorbed by vascular components with a sufficient number of chromophores. Thus, pulsed-dye laser therapy has been suggested as an additional therapeutic option for improving rosacea with grade C and D recommendations.6 In the present study, we report the cases of two patients with papulopustular or erythematotelangiectatic nasal rosacea who were effectively treated with an invasive pulsed-type, bipolar alternating current (AC) radiofrequency (RF) device using microneedle electrodes. Two Korean male patients (24-year-old and 76-year-old) with Fitzpatrick skin type IV, who were clinically diagnosed with nasal rosacea, participated in this study. The first patient presented with localized, recurrent erythematous papulopustular lesions on the nose, along with a few pustules on the perioral area (Fig. 1A). The second patient exhibited markedly telangiectatic lesions on a mildly phymatous nose (Fig. 2A). Previously, the first patient had been intermittently treated with oral and topical antibiotics for inflammatory acne lesions; neither patients had been treated with any light or laser devices, oral or topical retinoids, or topical metronidazole or brimonidine tartrate gels for the treatment of localized nasal rosacea within the most recent 1 year. Otherwise, they had no remarkable familial or medical history. After obtaining written informed consent, the patients were treated with six (patient 1) and 12 (patient 2) sessions of invasive pulsed-type, bipolar AC RF treatment using microneedle electrodes (SYLFIRM; Viol, Kyunggi, Korea) for localized nasal rosacea at two-week intervals. The skin along the nose was cleansed with 70% ethanol and anesthetized with topical anesthetic cream for 30 minutes prior to the treatment. Then, invasive pulsed-type, bipolar AC RF treatment was delivered with a power level of 3, a microneedle penetration depth of 1.5 mm, and 2–3 passes. All shots were delivered after gently pressing the disposable tips on the skin for proper penetration of the microneedle electrodes into the target area. Immediately after treatment, the treatment area was cooled with ice-packs. No prophylactic systemic or topical antibiotics and corticosteroids were prescribed to the patients immediately after or during the course of treatment. The first patient presented with marked clinical improvement in both overall redness and the papulopustular lesions on the nose from the fourth session of treatment with the invasive pulsed-type, bipolar AC RF device. Further improvement in the nasal rosacea was recorded with subsequent treatments (Fig. 1B–D). The second patient experienced noticeable improvement in both the texture and the telangiectatic lesions of the nose from the fifth session of treatment, and pronounced clinical improvement was recorded at one month after the final treatment session (Fig. 2B–D). Both of the patients were very satisfied with the clinical outcomes, and no remarkable side effects, including immediate excessive bleeding or oozing, worsening of the nasal rosacea, folliculitis or furuncle, post-therapy prolonged erythema, post-therapy dyschromia, or scarring, were reported. As well, pain during the invasive pulsed-type, bipolar AC RF treatment was well tolerated with topical anesthetic cream in both patients. Our two patients presented with localized papulopustular and erythematotelangiectatic nasal rosacea, respectively. As the vascular components and surrounding dermal tissues exhibit high current densities, the pulsed-type delivery of bipolar RF energy was able to effectively treat the abnormal vascular components of the nasal rosacea lesions in our patients without producing excessive thermal injury to the epidermis and dermis. However, the optimal treatment settings for maximizing the vascular selectivity of invasive pulsed-type, bipolar AC RF energy remains to be elucidated. Both of the patients demonstrated noticeable clinical improvement after four to five sessions of invasive pulsed-type, bipolar AC RF treatment and showed further improvement after additional sessions of the treatment. Interestingly, the first patient also experienced marked decreases in inflammation, and the other patient showed textural improvement in the phymatous-appearance of his nose. This led us to suggest that our treatment using a pulsed-type RF device could have generated subcellular, electrical thermo-modulating effects on the inflammatory cells and dermal mesenchymal cells, in addition to the dermal vascular components. 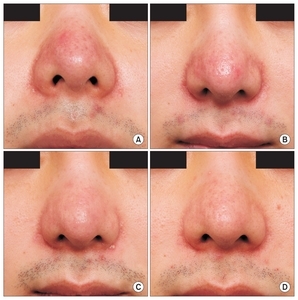 In this report, invasive pulsed-type, bipolar AC RF treatment using non-insulated microneedle electrodes proved to be safe and effective in treating papulopustular and erythematotelangiectatic rosacea localized to the nose in two male Korean patients. Accordingly, we suggest that treatment with invasive pulsed-type, bipolar AC RF devices may be an additional therapeutic option for treating various types of localized nasal rosacea. However, histopathologic investigations to evaluate the effects thereof on targeted vascular components are lacking. Randomized, prospective, controlled clinical trials should be followed to confirm our findings. We would like to thank Anthony Thomas Milliken, ELS, (Editing Synthase, Seoul, Korea) for his help with the editing of this manuscript. Fig. 1. 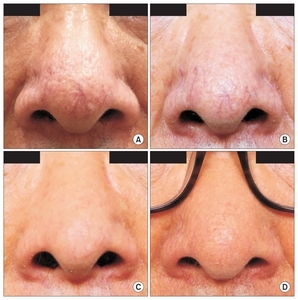 Normal light-exposed photos reveal papulopustular rosacea along the nose in a 24-year old man at (A) baseline, at two weeks after (B) two sessions and (C) four sessions, and (D) at four weeks after six sessions of invasive pulsed-type, bipolar alternating current (AC) radiofrequency (RF) treatment using microneedle electrodes. Bernstein, EF, and Kligman, A (2008). Rosacea treatment using the new-generation, high-energy, 595 nm, long pulse-duration pulsed-dye laser. Lasers Surg Med. 40, 233-9. Lee, WJ, Lee, YJ, Won, CH, Chang, SE, Choi, JH, and Lee, MW (2016). Clinical evaluation of 30 patients with localized nasal rosacea. J Dermatol. 43, 200-2. Wilkin, J, Dahl, M, Detmar, M, Drake, L, Feinstein, A, and Odom, R (2002). Standard classification of rosacea: report of the national rosacea society expert committee on the classification and staging of rosacea. J Am Acad Dermatol. 46, 584-7. Wilkin, J, Dahl, M, Detmar, M, Drake, L, Liang, MH, and Odom, R (2004). Standard grading system for rosacea: report of the national rosacea society expert committee on the classification and staging of rosacea. J Am Acad Dermatol. 50, 907-12. Erceg, A, de Jong, EM, van de Kerkhof, PC, and Seyger, MM (2013). The efficacy of pulsed dye laser treatment for inflammatory skin diseases: a systematic review. J Am Acad Dermatol. 69, 609-15.e8. Cho, SB, and Kim, HS (2016). High-frequency alternating electrical current: selective electromagnetic tissue reaction. Med Laser. 5, 1-6. Taheri, A, Mansoori, P, Sandoval, LF, Feldman, SR, Pearce, D, and Williford, PM (2014). Electrosurgery: part I. Basics and principles. J Am Acad Dermatol. 70, 591.e1-14. Yarmush, ML, Golberg, A, Serša, G, Kotnik, T, and Miklavčič, D (2014). Electroporation-based technologies for medicine: principles, applications, and challenges. Annu Rev Biomed Eng. 16, 295-320. Choi, M, Choi, S, Kang, JS, and Cho, SB (2015). Successful treatment of refractory melasma using invasive micro-pulsed electric signal device. Med Laser. 4, 39-44. Zheng, Z, Goo, B, Kim, DY, Kang, JS, and Cho, SB (2014). Histometric analysis of skin-radiofrequency interaction using a fractionated microneedle delivery system. Dermatol Surg. 40, 134-41. Na, J, Zheng, Z, Dannaker, C, Lee, SE, Kang, JS, and Cho, SB (2015). Electromagnetic initiation and propagation of bipolar radiofrequency tissue reactions via invasive non-insulated microneedle electrodes. Sci Rep. 5, 16735.